Everybody knows the story of the three little pigs. Each little pig builds its house out of a material sturdier than the last. One chooses straw. One chooses sticks. One chooses bricks. The big bad wolf blows down the houses of the first two pigs and is unable to destroy the home of the third. 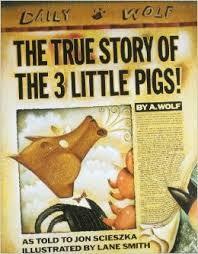 The True Story of the 3 Little Pigs! by Jon Scieszka presents the wolf’s side of the story. It provides a hilarious, new twist on a childhood classic. According to A. Wolf, he was baking a birthday cake for his dear old grandma when he ran out of sugar. He visited his neighbors, the three pigs, looking to borrow a cup of sugar. It just so happens that A. Wolf had a cold, which caused him to sneeze. He claims, blowing down the houses of the first two pigs was an accident. The True Story… (Guided Reading Level: Q) is great for readers of all ages, from kindergarten to 5th grade. I’ve used this picture book with upper elementary students to encourage them to consider different perspectives in the texts they read, whether they are reading fiction or non-fiction. Near the end of the school year, we have a unit on Independent Writing Projects. Each year, inspired by this book, at least one student will try his/her hand at rewriting a classic fairy tale from a different point of view.